A Continental Design for flood and erosion control, and water for power, irrigation, transportation, recreation, and climate modification. One sea level seaway would be the Chignecto Canal between Nova Scotia and New Brunswick connecting the Bay of Fundy to Northumberland Strait, providing a direct navigational shortcut into the Gulf of St. Lawrence. Another would be the Tehuantepec Canal across the Isthmus of Tehuantepec, providing inter-oceanic travel from the Atlantic to the Pacific. Still another would be a sea level seaway from Puget Sound to the Columbia River. There would be a sea level canal from New York Harbor to the Delaware River just north of Camden, New Jersey, and a sea level canal from the Delaware to Chesapeake Bay. These sea level canals would be 20 meters deep and 200 to 250 meters bottom width. In the transcontinental classification there would be a waterway from the tidewater on the St. Lawrence to the head of the Great Lakes. Another would go from New York up the Hudson via canal to Lake George, Lake Champlain, and the Richelieu River into the St Lawrence at Sorel, Quebec. Another transcontinental canal would follow the Hudson River and replace the present Erie Barge Canal into Lake Erie and Lake Ontario. On these canals the giant in­land marine trains of Technocracy and all types of North American ocean-going traffic would operate. 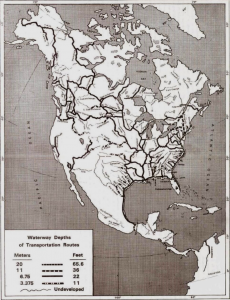 There would be two transcontinental waterways, one across western Canada and one across the United States. The Canadian transcontinental water­way would have two eastern access points, one from Lake Superior and the other from Hudson Bay into Lake Winnipeg, both entrances going west via Qu’Ap­pelle Valley, North Saskatchewan River, and so on. In the United States, the transcontinental water­way would utilize the Missouri westward to the Rockies, with an interconnecting link with the Canadian transcontinental system near Williston, North Dakota. It would cross the Continental Divide near Helena, Montana, into the Clark Fork and down that river to connect with the Columbia River system and finally the Pacific. Lake Albany, mention­ed later, would undoubtedly require a deep water connection with James Bay or Hudson Bay and also into Lake Superior. The Great Lakes in the United States would be connected west and south to the Ohio and Mississippi River system by canals of the transcontinental waterways classification, from Ashtabula, Ohio, to Beaver Falls, Pennsylvania, on the Ohio River; from Toledo, Ohio, via the Maumee and the Miami to the Ohio River below Cincinnati; from Lake Michigan via the Illinois and other rivers to the Mississippi; and from Green Bay via Fox River, Lake Winnebago, and the Wisconsin River to the Mississippi and thence to the Gulf of Mexico. In the far north the Yukon River in season would be a main water highway from the Pacific Ocean starting at the Taku Trough near Skagway and continuing for 1,800 miles to the Bering Sea. The Fraser would be connected with the Columbia via the Thompson River, Lake Shuswap, and the Okanagan Lakes. In the north, the Fraser would likewise be connected via the Parsnip with the Peace River across the Great Divide. The Peace River would be dammed; the Atha­baska River would be dammed; and, via a ‘greater’ Lesser Slave Lake and the Athabaska River and canal, would connect with the North Saskatchewan River. The South Saskatchewan would be connected by canalization with the Missouri at a point near Williston, North Dakota. The North and South Saskatchewan would be dammed and connected west of Prince Albert. These connections would provide main transportation from the Gulf of Mexico to the Arctic, and to the Pacific. The dams on the North and South Saskatchewan Rivers would flood the great Qu’Appelle Valley to connect with Lake Winnipeg. At Duluth, the Continental Hydrology would connect the Great Lakes and the Mississippi by canal. Another canal at the connecting point would go west to join the Mississippi with the Red River, providing water transportation up the Mississippi into Lake Superior or up the Red River into Lake Winnipeg, or from the Great Lakes into the Red River, Lake Winnipeg, and Qu’Appelle Valley and on. The Attawapiskat and other rivers on that height of land would be dammed, creating Technocracy’s Lake Albany, the largest projected artificial lake in the world, as large as Lake Superior. Lake Albany would empty into Lake Superior via Long Lake, at Jackfish, and would turn the water of the northern watershed (now flowing unused into Hudson Bay) south into the Great Lakes and the St. Lawrence and Mississippi sys­tems, producing millions of kilowatts of firm power. The Attawapiskat and other rivers on that height of land would be dammed, creating Technocracy’s Lake Albany, the largest projected artificial lake in the world, as large as Lake Superior. Lake Albany would empty into Lake Superior via Long Lake, at Jackfish, and would turn the water of the northern watershed (now flowing unused into Hudson Bay) south into the Great Lakes and the St. Lawrence and Mississippi sys­tems, producing millions of kilowatts of firm power. The Continental Hydrology would provide second­ary water channels on all the main tributaries of the Mississippi east and west — for instance, on the Arkansas to Pueblo, Colorado, and on the South Platte. The Continental Hydrology would dam the Tennes­see River at a point below Florence, Alabama, opposite Short, Mississippi, cutting southwest through the ridge to a point below Corinth, Mississippi, and creat­ing a new waterway to the Gulf via the Tombigbee River. This would create more power than the entire hydroelectric output of the present T.V.A. and not only would provide a new waterway across Mississippi and Alabama, but would lead the excess water of the Tennessee away without its contribution to flood water congestion in the Ohio and Mississippi. The Continental Hydrology would also involve the reconstruction of the Tennessee Valley, with dams and marine locks built to Continental hydrological specifications. It would involve the canalization of the Delaware, Susquehanna, Potomac, and other minor rivers. There would be an inside waterway down the Atlantic Coast of the United States and Mexico, a primary classification, from Boston Harbor through Long Island Sound. The inside waterway would pass through the sea level canal from New York Harbor to the Delaware, and the sea level canal from the Delaware to the Chesapeake; from the bottom of the Chesapeake Bay it would become an inside waterway of primary classification. It would cross Florida at Jacksonville to the Gulf side and run around the inside of the Gulf Coast of United States and Mexico /town to the Tehuantepec Canal. This general description of a Continental Hydrology indicates the tremendous hydroelectric power potential of the North American Continent which is presently estimated at 313,000 megawatts not including power which could be developed by a Continental Hydrology. For a variety of reasons the total development of all hydroelectric power potential is probably not feasible: however, there is still considerable undeveloped potential remaining in North America since our existing hydro­electric capacity is less than 20% developed. The power system that serves this Continental area should be a Con­tinental system based on Continental concepts, not an amalgamation of thousands of small, inefficient, loosely connected systems whose prime objective is making money, not power. There are approximately 3,400 such systems in the United States alone, and it is simply not possible to build an efficient Continental power system by inter­connecting 3,400 anachronisms together with AC tie lines. Any Continental power system in North America should consist of the following: A complete and effective use of hydroelectric power potential because it is far more efficient than thermal — it does not consume any ir­replaceable resources and causes only minor ecological readjustments; a one-million volt or higher DC trans­mission grid covering the entire Continent; a system of load shedding to prevent major system blackout in the event of low frequency; a concerted effort to standardize all component parts of the system to the greatest degree possible without jeopardizing technological progress; development of a full range of alternatives including nuclear fusion, solar, geothermal and tide water, as well as improved methods of converting heat to energy such as MHD (magneto-hydrodynamics). The efficiency and reliability of a power system is partly a function of the strength and efficiency of its transmission system. DC transmission is more efficient and far more reliable than AC, and an underground system would not be subject to hazards caused by the weather, low flying aircraft, or idiots with guns. It is for this reason that Tech­nocracy proposes the following specifications for a one-million volt, or higher, underground DC transmission grid covering the North American Continent. Technologists have been working on the problems of power transmission, and today the way is open for the transmission of electricity for 3,000 miles and more. Until the advent of high voltage transmission, 300 miles was a great achievement, but technology can annihilate distance and bind this Continent into one indivisible unit. The power would be generated by presently in­stalled type of equipment, which is mostly 60 cycle- 3 phase, AC, at generator voltage; and would be stepped up by transformers to 1,000,000 volts, 60 cycle, 3 phase, AC. It would be converted from 1,000,000 volts, 60 cycle, 3 phase AC, to 1,000,000 volts direct current. All main transmission lines would be 1,000,000 volts DC. The transmission cables would be 2,500,000 circular mils copper conductor or aluminum equiva­lent. These conductors would be carried underground in the same manner as a pipeline, using standard specification oil pipeline for the outside. Inside would be Pyrex glass or plastic pipe centered within the steel pipeline by glass Pyrex rings. The Pyrex glass pipe, surrounding the 2,500,000 circular mil conductor would be of such a diameter and such strength as to carry sufficient nitrogen gas under pressure to act as a primary insulating medium around the copper conductor. The conductor would be centered within the glass pipe by skeleton glass rings. The space between the Pyrex glass pipeline and the steel pipeline would be filled with oil of the re­quired dielectric property and dyed so that in case of leakage the color would show on the surface. This 1,000,000-volt pipeline transmission system would be built in duplicate, otherwise known as two circuits. Direct current carried at 1,000,000 volts can be transmitted 3,000 miles with a transmission loss of approximately 10 percent. A Continental transmission system so designed would enable power to be shifted to meet any Continental emergency or demand. It would render power so cheap that the selling and purchasing of power by private utilities could not be tolerated. Secondary distribution would utilize existing secondary lines. The 1,000,000-volt DC pipelines could be tapped at any point into converters and converted to 60 cycle, 3 phase alternating current and stepped down to the required secondary voltage, thereby rendering unnecessary the scrapping of any existing secondary distribution equipment. Most of the electric utilities’ existing transmission systems of approximately 230 KV or less would be considered as existing secondary distribution equipment. The load areas served by the present utilities would therefore determine the location of the various DC taps. A direct current transmission system would enable the development of hydroelectricity in any part of the Continent. In the North lie vast sources. The surplus, after meeting all requirements in those areas, would be available for other areas where needs are greater. It could therefore be sent to southern portions of the United States; and the power generated in the southern portions of the United States could be sent still farther south to Mexico, Central America, and the Caribbean littoral. The power of the Yukon could go to Los Angeles if necessary. Power from the Churchill in Manitoba would be available in New Mexico. East and west, north and south, across the Continent would go the network of main transmission lines with its system of secondary distribution lines and equipment. A system like this, utilizing DC transmission and falling water (the most efficient, reliable and ecologically least damaging source of power available) as the prime mover would be a Continental system with a Continental concept. North America has reached a state of physical development that requires thinking and operating on a Continental scale. Our develop­ment thus far has been largely unplanned. Some people have called unplanned physical growth ‘pro­gress.’ However, a close examination reveals that this so-called progress is evidence of a dangerous social disease which must be eliminated if we, as citizens of North America, expect to survive. Some of Technocracy’s proposals have been derided as being unrealistic or too far advanced. No doubt they do seem unrealistic to the socially uninformed, or too far advanced to those who approach the future looking backwards. 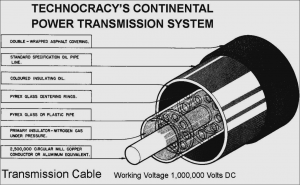 However, the rapidly developing problems of the Continent are sufficient evidence to make any reasonably intelligent and socially conscious person realize that Technocracy’s proposals for a Continental Hydrology and one-million volt DC transmission system, while ahead of most people’s concepts, are actually just in time to prevent chaos in these specific areas. This does not mean that nothing else needs to be done to insure our future; it obviously does. It is a just recognition that water and power are essential elements of our high-energy civilization and that we have been doing a very poor job of utilizing them. The concepts and general specifications contained in this pamphlet were not prepared to amuse those unpatriotic people who lack sufficient concern to take any part in insuring their own future or the future of their country. This pamphlet is to show that the unrestricted application of the skills of North America’s technical people can solve some of the very critical problems we face. Technocracy is only sketching the highlights of what must be done. This is but a glimpse of the Continental water and power systems, as staggering and incredible to doubters as was Continental railways in the early part of the nineteenth century, yet practically and physically possible from an engineering standpoint. The Continental water and power system will be the responsibility of the Engineering Corps of the Continent, which will be charged with the design, maintenance, and operation of this, the greatest of all projects—the Continental water and power system. The arrival of a Technate on the North American Continent will be the next major step in the evolution of American water transportation and power genera­tion. When that time comes, the Engineering Corps can go forward, unhampered by business or political interferences, to create the greatest Continental water transportation and power system of all time. This Continental water and power system of the New America involves a far-flung problem of the control of water-flow and the transmission of power. Water and power will be taken from areas of low con­sumption to areas of high consumption. Then, and not until then, can we have one Continent, one techno­logical control, and one people—one and indivisible.